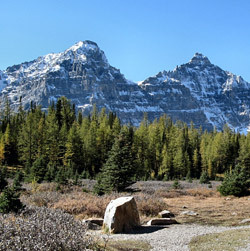 Mount Tuzo is the most massive of the "Ten Peaks" when viewed from Moraine Lake. 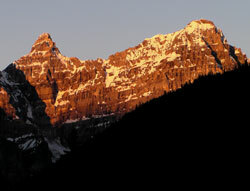 One of the first mountains in the Canadian Rockies to be named in honour of a lady mountaineer is Mount Tuzo (Peak #7). Miss Henrietta "Hettie" Tuzo was the first to climb this peak. A charter member of the Alpine Club of Canada, Miss Tuzo had climbed several peaks in the Rockies and Selkirks when she and guide Christian Kaufmann made the ascent in 1906. They climbed the couloir between Mount Bowlen and Tonsa and then crossed a snowfield behind Peaks Four, Five, and Six en route to the peak. During the descent they narrowly avoided an avalanche during which, "huge boulders plowed down over our tracks." The mountain was renamed in her honour in 1907. Hettie's son, John Tuzo Wilson, became a well known Canadian geologist, particularly in the area of continental drift and plate tectonics.